Every summer we go for a ‘big family day out’ – a day trip to somewhere that we wouldn’t ordinarily be able to afford because as a family of five (sometimes six if we have the teenager staying with us) entry fees for attractions can be rather steep. We save up for it throughout the year and the girls all know it’s a special treat rather than an everyday occurrence, which I think makes them look forward to it even more. It’s become a bit of a summer tradition now and it’s my absolute favourite day of the six week break. The anticipation leading up to it is tangible and the excitement levels (from all five of us!) on the morning of the big day are always ridiculously high. It just so happened that this year the date we’d chosen to have our big day out coincided with the husband and I’s fourteen year anniversary of being together and so we decided to combine the two in order to celebrate together as a family. In previous years we’ve visited Chester Zoo and Legoland Windsor, both of which were fab. This year the girls chose to return to Warner Bros Studio Tour, aka ‘Harry Potter World’. We have visited once before, three or four years ago, but the girls were all much younger then and the littlest two hadn’t read the books or seen the films at that point so we knew we’d be paying a return visit further down the line in order that they could fully experience the magic too. At the moment, it’s Mimi that’s currently obsessed with Harry Potter. They are pretty much the only books she reads (over and over and over again – as soon as she finishes the set she starts from the beginning again) and her bedroom is a curious mix of half Liverpool Football Club paraphernalia and half Harry Potter posters and trinkets. 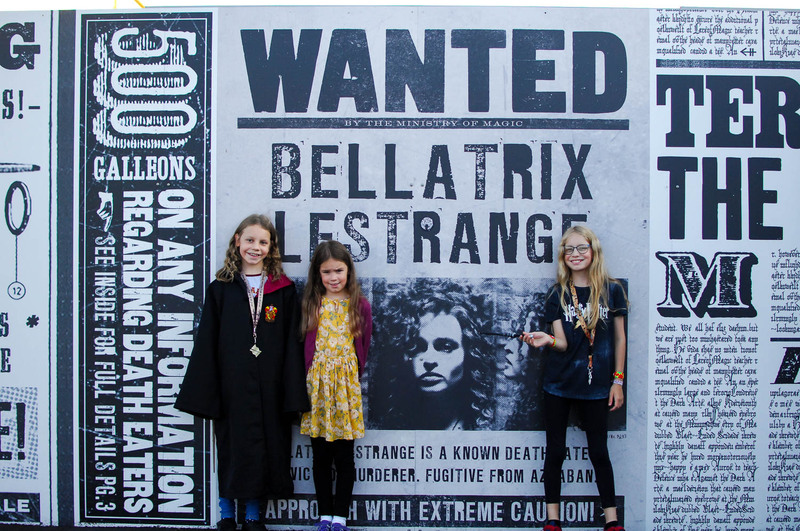 Lola is just starting out her journey into the wizarding world of Harry Potter – she’s seen the first four films and is about halfway through reading the first book, on the cusp of truly being able to appreciate the Harry Potter magic. 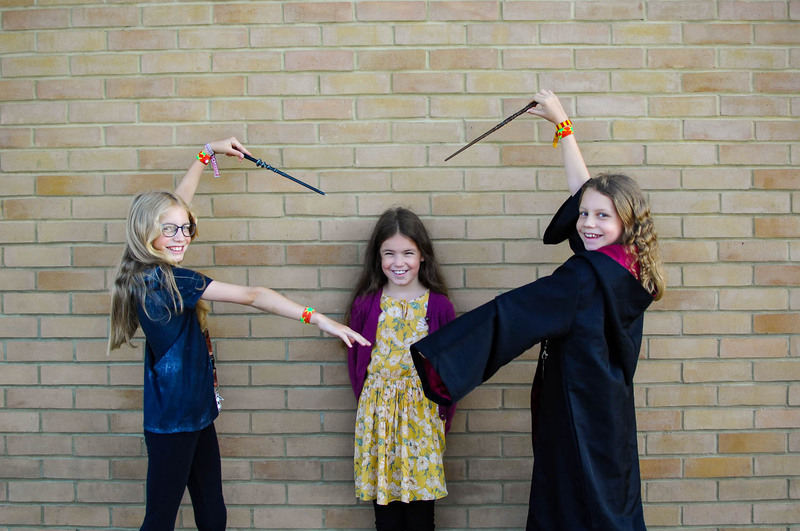 Ella, the original fan in the family, claims she’s too old for Harry Potter now, but she insisted on wearing her Gryffindor robes and taking her wand with her so I think secretly she really does still love the magic of it all. The husband and I are big fans too, so Harry Potter World really is somewhere that appeals to us as a family. We were all excited to see the extra additions to the tour – the Goblet of Fire installation that was there over the summer, plus the new and exciting Forbidden Forest to explore. Knowing from previous experience that you really need the whole day there, I made sure I booked an early time slot as there is so much to see and do and I wanted to make sure we had enough time to see it all without hurrying through. And so we left our house at 6am and made the long drive down to Leavesden, arriving with half an hour to spare before our designated entry time of 9am. It was already incredibly busy by that point, but even with all the security and ticket checks it was smooth and fairly quick to get inside. One thing I love about Harry Potter World is that the magic really does start right from the very beginning of your experience. The attention to detail is phenomenal and it makes for a very special day. Walking down the entrance tunnel. The walls were covered in a design to make it look like the Marauder’s Map. There are so many different areas to explore within the Studio Tour: various incredible sets from the films; a vast amount of props; actor’s costumes; models of magical creatures; artwork; scale models; special effects… it’s quite something to behold. It’s pretty much a one-way circuit, though it is possible to double back on yourself if you accidentally miss something. Everyone starts off in The Great Hall, which is where the Goblet of Fire installation was situated. We got a demonstration of it working and a name popped out of the goblet, which was fun to see. There was even the age-line (and no, no-one tried to cross it!). Beyond the Great Hall is an enormous warehouse which is home to all the props; numerous smaller sets such as Dumbledore’s office, The Burrow and Hagrid’s Hut; costumes, wigs and makeup; plus several interactive displays. At first glance it can be quite overwhelming – my suggestion is to work your way around slowly. It’s well worth taking your time because there are so many little tidbits of information and details to absorb – if you speed around you’ll miss the most fascinating parts! There are activities to keep kids (and grown ups!) occupied too – everyone gets given a passport at the entrance to the tour and there are six stamps to collect as you make your way through the exhibits – one in each area. Plus there are golden snitches (very cleverly hidden!) that need to be found, each with a clue to where it might be, which turns the tour into a bit of a treasure hunt too – genius! Also dotted around the warehouse are various activities to take part in. The girls each had a go at flying a broomstick and we all dressed up as (happy!) Death Eaters for a ‘Wanted’ poster photograph too. Last time we visited we bought the photographs of the girls on the broomsticks and so this time we opted for the one of us as a family instead and I love it. It’s cheesy but sometimes these things just have to be done. There are LOTS of opportunities to spend money. Considering how much it costs to visit Harry Potter World in the first place, this does bother me a little bit and we’re always quite firm about not going mad and buying everything. Each printed photo costs £15 (and you get a free digital download too), which is why we only bought one, plus there are strategically placed mini-shops scattered throughout the tour. Be warned – they don’t have everything in the big shop at the end as I thought they would! The Forbidden Forest was ace. Spooky enough to make Lola to cling onto my hand a little bit tighter, but not so terrifying that little ones would be traumatised. Seeing Aragog in all his glory and getting the opportunity to bow to Buckbeak (and have him bow back to her in return – he doesn’t bow to everyone so she felt very special!) were definite highlights for Mimi. After the Forbidden Forest is Platform 9 and 3/4 and the actual Hogwarts Express. It’s very impressive to see in real life and the girls all loved getting to walk through the carriages. Another new addition that wasn’t there last time we visited is the opportunity to sit in the Hogwarts carriages and have a go at a bit of ‘green-screen’ acting – seeing a chocolate frog hop across the window and a dementor appear at the glass had everyone giggling and shrieking. By this point everyone’s tummies were rumbling and we’d been exploring for about three hours. Just past the Platform 9 and 3/4 set is the Backlot Café, which has a decent selection of sandwiches, salads, sweet treats and drinks to choose from. There’s plenty of space and we took the opportunity to talk about what our favourite things had been so far. We unanimously agreed “All of it!”. The Backlot Cafe is also where you have the chance to try Butterbeer. The girls had tasted it on our previous visit and weren’t fans, though they did love the ginormous butterbeer ice creams (soft serve Mr. Whippy ice cream with a butterbeer sauce running through it). I’ve never seen them beaten by an ice cream before but these were so huge that none of them could finish it. Our energy levels renewed, we headed outside to the Knight Bus and No. 4 Privet Drive, which you’re now able to go inside – another new feature on the tour. Hagrid’s motorbike and the Wizard’s Chess pieces are all in the same area, plus Godric’s Hollow, the Hogwarts Bridge and the flying Ford Anglia car too. Photo opportunities galore. I loved this room in 4 Privet Drive! It’s so cleverly done. Each display had detailed information boards that appealed to kids as well as adults – we all learned so much just from reading them. The second half of the Warner Bros Studio Tour is dedicated to showing exactly how the Harry Potter films were created – all the inner workings and behind-the-scenes magic. I found the masks and models and mechanics of it all absolutely fascinating – the sheer amount of work and number of hours that goes into each and every piece is quite astonishing. The girls had fun ‘being’ Dobby on a CGI screen (watching them making him floss was hysterical) and we were all slightly horrified by the first incarnation of Lord Voldemort from the Philosopher’s Stone and jumped an absolute mile when the model actually moved! It really puts into perspective just how many people must have been involved in creating the films and bringing them to life from the original Harry Potter books that JK Rowling wrote whilst sat in a café hoping that someone would love them enough to publish them. It’s staggering. I found this section of the tour fascinating – all the behind the scenes information about how the films were created and brought to life. A display of every single hat from each of the Harry Potter films! Diagon Alley was the next stop on the Harry Potter Studio Tour and of course it didn’t disappoint. Again, the attention to detail just blows my mind. I always feel slightly sad that you can’t actually go in the shops, but seeing all the iconic names – Ollivander’s Wand Shop, Gringotts Wizard Bank, Flourish and Blott’s – really does make it all seem so real, as if you’ve just stepped off of a bustling London street into the world of wizards and witches. Next up was the Art Department (Ella was fascinated by the scale models of some of the building in the Harry Potter films – the Durmstrang ship and the Lovegood’s house were my personal favourites) followed by the grand finale. The first time we visited, we had no idea what to expect and didn’t even realise we were near the end of the tour, so when we rounded the corner and were faced with the incredible model of Hogwarts it quite literally took our breath away. This time around we knew it was coming but the impact was no less impressive. The intricate details compared to the size of it are utterly captivating and we could have spent hours there inspecting it and attempting to take it all in. It’s tricky to get an idea of the scale of the model of Hogwarts from this photo, but if you look at the middle right-hand side of the image you’ll see some people looking over the railings at it which will give you an idea of just how big it is. After the Hogwarts Castle there is the Wand Room. Every single cast and crew member had their very own wand made just for them and if you look carefully you’ll be able to find J.K.Rowling, Emma Watson, Daniel Radcliffe, Rupert Grint, Emma Thompson, Alan Rickman, Maggie Smith and all the other actors’ and actresses’ wands. It’s a fun way to finish off the Harry Potter studio tour and, whilst we didn’t find everyone, we did manage to spot a few. The final stop of our Harry Potter experience was, of course, the souvenir shop. We’d promised the girls a present each as a memento of our day, like we do every year from our big family day trip. Ella already had a wand (Hermione’s) from our previous visit to Harry Potter World, but Mimi and Lola were yet to be officially inducted into the world of wands. Mimi already knew she wanted Voldemort’s (she has a *slightly* concerning fascination with the Dark Arts), but Lola wasn’t sure. She spent ages trying to decide until I reminded her that the wand chooses the wizard and, after testing each and every single one out, eventually decided that Luna Lovegood’s wand felt right. Ella chose a special Ravenclaw pen instead of a wand and i’s her pride and joy. Honestly, you could spend hours in the shop alone – it’s full to bursting with Harry Potter treasures. There are a few pocket money items like pencils, key rings and magnets but the rest of it is quite expensive (it’s £9 for a chocolate frog or a box of Bertie Bot’s Every Flavour Beans for example). It’s definitely worth factoring in plenty of time to have a look round – there is some amazing stuff in there for Harry Potter fans both big and small. We had a wonderful time at the Warner Bros Studio Tour and I’m so happy the girls chose it as their big family day out this year. I have a feeling we’ll be back again for a third visit in a few years time as Lola falls in love with the wizarding world of Harry Potter too, and I’m sure there will be even more additions and improvements next time around. For now we’ll just have to content ourselves with daydreaming about one day maybe getting to visit The Wizarding World of Harry Potter at Universal Studios in Orlando Florida, and looking forward to the release of the second Fantastic Beasts movie this coming November – I’m excited already! 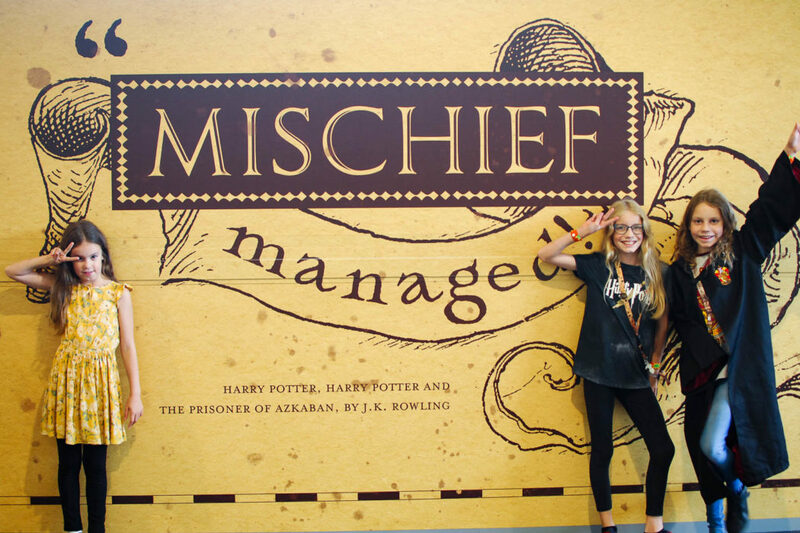 It’s a must-visit for any Harry Potter fan Jess – do it! Oh my goodness I love it. I am huge Harry Potter fan can’t wait until my kids are old enough to read the books and venture to something like this looks amazing. It’s ace there Jenny, it really is. I was so excited when my older two girls started reading the books and I could share in their love for all things Harry Potter related. Oh Sarah you HAVE to go and see it now – I bet it’s changed so much from when you were last there. Does Joe still like Harry Potter? I’ve not even heard of the House of MinaLima! I shall investigate – it sounds interesting. I bet George would absolutely love it there now that he’s a little bit older. It’s such a great, fun-filled family day out. I love that she kept her cape on too! She still protests that she doesn’t like it that much any more but whilst we were there (and for a couple of weeks afterwards) she was definitely caught up in the magic. It really is the most incredible place – your kiddos will love it once they’re old enough to appreciate it. Oh no! That’s such a shame. The tickets do sell out really quickly – I booked ours six months in advance to make sure we got a decent time slot that would allow us to see everything. I really hope you get there one day – it’s such a fun day out! Oh Katy – how can you not be taken over by the magic of it all?! I’m sure you’ll fall in love with it along with M as she works her way through the books. To be honest though, even if you’re not a huge fan, Harry Potter World is a fab day out for the whole family. We have two massive HP fans in our house (my hubby is actually reading a chapter to my 7yo as I write this!). My 10yo is lucky enough to be visiting in a few weeks with his school but I know we’ll need to visit with both of them soon – your post has really whetted my appetite! Wow, what an awesome school trip! Hope he enjoys it. You’ll definitely need to go with both of your boys if they love Harry Potter – it’s such a fantastic experience. I’m glad it was helpful for you Sinead! What a brilliant idea to give it as a Christmas gift! We try and give experiences over ‘stuff’ where we can too.